Nectria canker on trees is a fungal infection. The pathogen known as nectria invades fresh wounds and damaged areas of bark and wood. If a tree is healthy, it can typically seal off the infection and recover with a callus formed. Weaker trees may get girdled and ultimately die. Know the signs of nectria canker, how to prevent it and what to do if you see it. What causes nectria canker disease is one of the several nectria fungal species. These fungi are opportunistic and attack trees at their weak spots from injury, pruning, root damage, freezing, pest infestations, and other diseases. Any damaged wood is susceptible to this pathogen and the resulting disease. 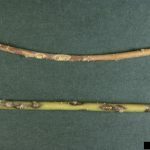 The characteristic sign of nectria canker is the formation of the cankers, wounds on twigs, stems, and trunks that look like sunken areas that may be discolored. The cankers may not be discovered until other signs of disease develop. These include girdled twigs and branches, dead branches that don’t produce leaves in the spring, and wilting on branches. You may also see the fruiting bodies of nectria. They typically appear in the spring and summer months and are orange or red spheres that are very small. Eventually, they turn a lighter color and grow white spores on the surface. Nectria rarely kills older, established trees. Most are able to fend off the fungus and form the characteristic calluses. Older trees that are not healthy may be vulnerable, but it is typically younger trees, especially those that are newly transplanted, that can be killed by nectria canker. There is no cure for nectria canker, so it is important to take steps to prevent it affecting young and vulnerable trees. Pruning injuries can be a major source of infection, so avoid pruning trees in the fall, especially in wet conditions. Restrict pruning to dry weather and remove any branches or stems that have been infected with the fungus. Freezing damage is another important way in which trees get infected. For young transplants, providing protection from freezing can prevent the disease. Avoid other types of injury and keep your trees healthy to minimize the risks from nectria infection. This means being careful with the lawnmower around trees, preventing or managing pests, and providing adequate water and nutrients.